In an ideal world, we’d all get the perfect amount of vitamins and minerals we need from our diets. The reality is, very few people get what they need simply from what they consume alone. Instead, the majority of people either go through their lives vitamin deficient or find a way to supplement what they’re missing with multivitamins. Unfortunately, many multivitamins don’t live up to their hype—either being chalk full of fillers, or not even being absorbed enough to make a difference. The good news is, there is a multivitamin form that stands above the rest when it comes to the benefits and advantages it delivers. We’re talking effervescent tablets. Here at Canadian Pharmacy Online, we carry the Sunlife Effervescent Multi-Vitamin Tablets manufactured by Sunlife Germany and it’s as good as it gets. 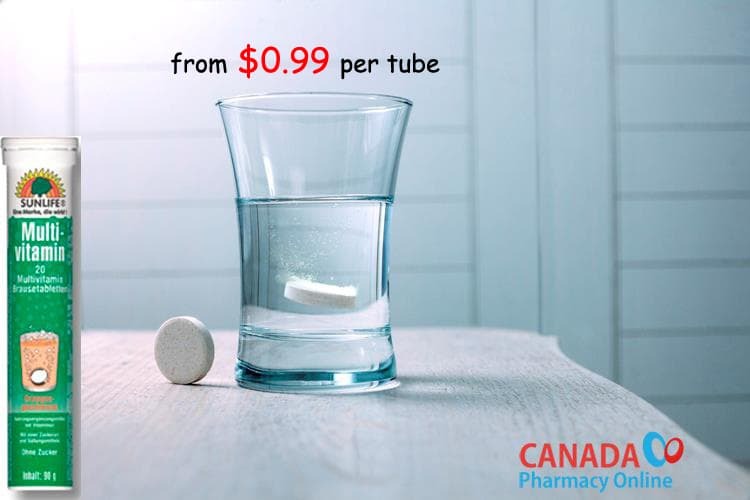 Get Sunlife multivitamins online at the best rates from our Canada pharmacy from $0.99 per tube. Let’s take a closer look. If you’re tired of swallowing multivitamin tablets and wondering whether or not they’re even doing any good, the effervescent multivitamin by Sunlife Germany provides some of the best health benefits around. 1. Supplement diet – Let’s face it, eating right is hard. Getting the proper recommended dosages of vitamins and minerals can be a challenge—especially if you’re using traditional tablet multivitamins. However, even when your diet is spot-on, you can still be missing crucial vitamins. These fizzy tablets will have you covered, topping up your daily dosages and keeping physical and mental strain at bay. Effervescent tablets can also be packaged with a higher volume of active ingredients than their tablet counterpart—making them a far more efficient delivery system. 2. Easier to consume – One lucky thing about Sunlife Effervescent Multivitamins is that they’re far easier to consume. For people who struggle with swallowing tablets, this could be a godsend. All you do is put the tablets in water, allow the carbon dioxide in the compound to help dissolve everything into the water—and drink. It can’t get much easier than that. It’s also easy on the stomach and esophagus, for those who need to be careful there. As a welcome bonus, the orange flavor tastes great, too! 3. Ease depression – Many people who suffer from depression are also vitamin deficient in some form or another. Research suggests, vitamin deficiency can play a role in some forms of depression—and eliminating the deficiency may also eliminate the symptoms of depression. By incorporating a multivitamin—particularly one that is 100% bioavailable like effervescent ones, you can help to limit depression’s scope. 4. Help for those who need it – Certain addictions, such as alcoholism, is known to cause nutrient and vitamin deficiencies in the body. For those working toward healing from these addictions, getting the added help and support to alleviate any vitamin deficiencies can be a life saver. Effervescent multivitamins are a convenient way to help the body absorb the vitamins, minerals, antioxidants, etc. they may not be able to absorb from their diet. 5. 100% Bioavailable – A typical tablet-form multivitamin is generally only 50-70% bioavailable (the quantity of the ingested dose absorbed), depending on various factors. The ingredients in an effervescent tablet is 100% bioavailable, thanks to the quick digestion of the broken-down vitamin in water. 6. CO2 – Because the Sunlife Effervescent Multivitamins have carbon dioxide present, the nutrients become more permeable—which is what helps the bioavailability and absorption. CO2 actually reduces the thickness in the mucus layer lining the intestinal wall, helping the vitamins and minerals absorb with better accuracy. In turn, this makes for a more reliable and consistent dosage each and every time. 7. Stomach pH prep – Effervescent tablets, when combined with water create a buffered solution—or the perfect balance between acidity and alkalinity. This is another way absorption is enhanced with this form of multivitamin. 8. Less fillers – Typical tablet form multivitamins will have fillers and binding agents to help with the digestion process, as well as other aspects of the delivery. With effervescent tablets, like the ones from Sunlife, you don’t have fillers—making more room for higher, more accurate dosages of the vitamins and minerals you really want. What’s in the Sunlife Multivitamin Effervescent Tablets? Most of the time, multivitamins are perfectly healthy to take. However, you should never take more than the daily recommended dose of this—or any multivitamin as it can cause some dangerous side-effects. If you have any health concerns, or if you’re pregnant or nursing, be sure to talk with your doctor about whether or not Sunlife Multivitamin Effervescent Tablets are right for you. Be sure to take this, or any multivitamin, when you’re not also consuming calcium supplements, antacids, or eating/drinking any dairy product as calcium can interfere with vitamin absorption. Your diet might not provide everything you need when it comes to vitamins and minerals, but that doesn’t mean you’re destined for a life being deficient. If you’re wanting to supplement your diet with a multivitamin, knowing it’s doing what it’s meant to—making the switch to an effervescent multivitamin, such as Sunlife’s Multi-Vitamin Effervescent Tablets could be just the thing. Whether you’re looking for better bioavailability, easier to swallow, or simply a change in what you’re used to—give it a try today.